2) Delete all the files in the "Data\Sounds" folder. Thanks for the quick reply, Tom. I have figured out how to run these other season/car sets with CSM but how does one get the TSM to work with these other carsets, i.e. to build/assign a different track set to the mod? Cannot locate a data/sounds folder(?). In fact, I'm not seeing how to open and explore any CSM mod files(?). CSM mod files are usually found in your gpsaves folder. Mine=c:\program files (x86)\infogrames\grand prix 4\gpsaves. Double-click the mod name in the CSM list of mods, it will open the folder containing the files. Or, navigate to "Grand Prix 4\GPSaves\Carsets\"
Got the car sound stuff down. How do I apply the custom car set mods to a custom track set created in TSM? I prefer to use GPxTrack instead of TSM to install custom tracks, and recommend that approach to others. If you really want to use TSM, have a search around these forums or if you have a specific problem you can start another post. I agree with TomMK. It's well worth learning how to use GPxTrack. TSM appealed to me the first time I used it (it is a nice idea) but it can be a bit complex to debug when it goes wrong and so GPxPatch is the way I do it now. I remember when I first started it seemed to be a nightmare to get tracks to work however I tried to do it but it's rare I have any problem at all these days. The only time I use TSM is to unpack a new .tuh file so I can use it with GPxTrack. On a related note, something I do which I think Tom does also is to maintain a series of GP4 folders, zipped up, so if I want to have a go at the 1995 season for example, I just unzip the GP4 (1995) folder and drive. It takes a bit of extra hard disc space, but it seems to me it's the way to go. For example, some of the mods I've downloaded had annoying bugs like mirrors being upside down etc. If you use CSM those bugs will reoccur each time you install the .cuh, but once I fix a mod and zip it up it's fixed for good; along with all the tweaked PF and MD files etc. After two years of tweaking and re-mixing I'm finally at the stage where I have seventeen (almost) perfect mods zipped up and ready to go. Another advantage is that because each mod is a completely separate installation of GP4 it's much harder to mess things up - and even if you do, you just unzip it again and away you go. Noog, I felt the same as you with TSM, and the tracks at the beginnig. Well, there is a way(trick) to use the mods made from CSM in alone. 1. Start mod in CSM. 2. When the game is started with sucess go back to Win destop(alt+TAB) without ending the game. 3.Make a new folder like "gp4 mod 1993" and copy the all gp4 folder where the mod is running. 4. Now you can end the game and start the mod in the new directory without CSM. There are some(a lot) files in the new directory who can be delete. And its more simple to modify things, like gpxpatch and gp4tweaker stuff. Edited 2 time(s). Last edit at 04/18/2019 08:20PM by landex. Hi. Yes, that's what I do too, except as a Linux user I run any new .cuh files through CSM in a virtual WinXP machine with a default GP4 installation, then go back into my native Linux environment and copy everything into a folder on there. Same thing really. I also delete unused bits where I can and especially before I zip the folder up for storage - but a warning to anyone else doing that - use caution. It's easy to delete too much and prevent the game from running so make a back up. I remember spending hours, maybe days, 'fixing' the 1979 beta season only to find it didn't work anymore because I'd deleted something or other - and because I didn't know any better at the time I re-installed the mod using CSM - only to realize just after I did it that I had completely destroyed all my fixes. Oh well, I guess it was a good learning experience but it was pretty frustrating at the time. I spend 2Months I remember the mod too: 1991. Phoenix was in the mod in those days. When I figure it out, it was easy. I suppose it would be the icing on the cake. I did fight with CSM a while back but didn't get much further than using it to unpack a .cuh from within Linux. That said, I'm able to run GP4 under Linux and WinXP under wine at the same time so VirtualBox bridges the gaps pretty well. One of the biggest annoyances for me is having to go into Windows to load up slimtex.exe to convert a GIMP modified .tga to a .tex and dump it in a .wad, but I can live with that. > problem you can start another post. With the gpxtrack method does the slot number you select need to match the 2001 track order/wad name? Eg if the wad is called Montreal does it need going onto slot 8 because round 8 in 2001 was Montreal? Or does it not matter you just select the track in the game menu with the slot you put it on? No, it doesn't matter which slot you use, GPxTrack can handle it, as long as there is only 1 track in the folder, like this. So only 1x .dat, 1x .wad, 1x .ini etc. The important point to remember is - regardless of which slot - I do advise that the .wad file should have an original 2001 filename, e.g. nurburgring2001.wad or indianapolis2001.wad. But it doesn't matter which one. And you are free to rename all the other files (.dat, .ini, .gpi, etc) but the .wad is sensitive and needs to keep its original 2001 name. Just one minor caveat RHill. I'm not sure if Tom has found this but once or twice (ie not very often at all), I've come across the odd track that I couldn't get to work in a non-standard slot with GPxTrack, but when I did put it back in it's original slot it worked OK. I think I know how to fix that properly now but it's worth bearing in mind if you get a problem getting a circuit to run and you're looking for a quick fix. The GpxTrack only managers the .dat files, not the wad file. 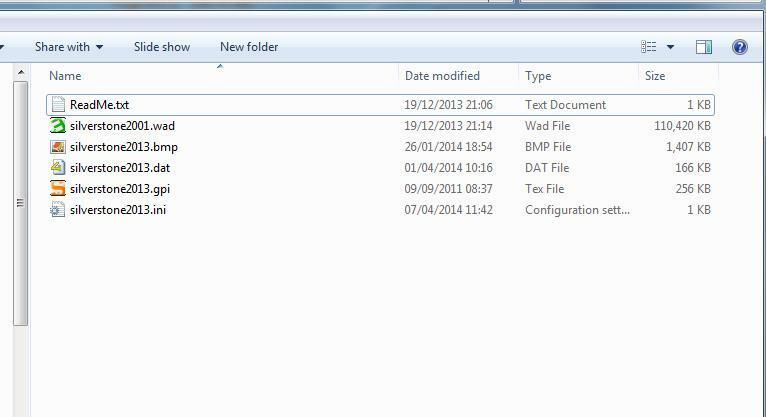 Its never need to rename the .dat files only the respective wad file and his contents. Its happen often, you choose dat but it loads a diferent wad. By the way: Are the commands for the Easywad in command prompt? You're not getting a warning about an 'illegal switch' are you? Set Default to "OPEN WITH GUI"
Update: * If you don't have an ADVANCED button, select WAD, click the CHANGE button and select EASYWAD. When you click OK you should now have an ADVANCED button. Edited 1 time(s). Last edit at 04/20/2019 09:59PM by Noog.